Throughout history, legacy creating, innovative decisions have distinguished between leader and follower; between insight and apathy; and ultimately, between success and failure. Such is the case with the history that has come to form the heritage of the Lake Erie College of Osteopathic Medicine. As the 20th Century drew to a close, those in governance of Millcreek Community Hospital (MCH) in Erie, Pennsylvania, were faced with a problematic decision. In an era during which it was becoming increasingly difficult to attract new physicians to the calling, this small community hospital sought to maintain its position of leadership within the field of health care. The dilemma was dissected by the group of visionaries at MCH who, through their astute prescience and vigilant observations, made a decision to open a new school of medicine. At a time during which much of the medical community did not see a need for additional medical colleges, much less the need for further physicians, the MCH Board saw it differently. The hospital existed in an area within close proximity to Pittsburgh, Cleveland, and Buffalo; an area underserved by physicians. The establishment of a medical college in Erie had the intended effect of allowing the hospital to train needed new doctors and to accommodate the open positions at MCH and at other hospitals throughout the region. The journey began in September of 1988, when the Board of Trustees of Millcreek Community Hospital conducted a major strategic planning retreat. Attendees at the planning session established a new hospital mission that emphasized the need for educating osteopathic physicians to provide medical services to the medically underserved areas across Northwestern Pennsylvania. In March 1989, the Board of Trustees assembled an Osteopathic Medical School Task Force that began to explore the feasibility of founding a new osteopathic medical school. 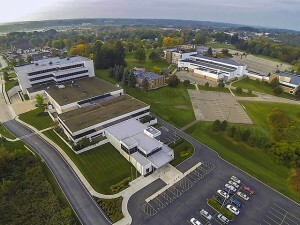 The Lake Erie College of Osteopathic Medicine (LECOM) was established as the 16th college of osteopathic medicine in the nation with its receipt of a Commonwealth of Pennsylvania Charter in December 1992. The Charter Class began on August 9, 1993 at a new campus on West Grandview Boulevard in Erie, Pennsylvania. With the graduation of the LECOM inaugural class on May 24, 1997, the College received full accreditation from the American Osteopathic Association. Since that time, LECOM has granted the Doctor of Osteopathic Medicine (DO) degree to almost 4,900 graduates as of 2015. The founding President, Joseph J. Namey, DO, was an acclaimed general practitioner and a tireless advocate of osteopathic medicine. A longtime resident of Erie, Dr. Namey has been credited with enhancing the image of osteopathic medicine across the country. John M. Ferretti, DO, succeeded Dr. Namey, becoming the second President of LECOM. Dr. Ferretti is a Board Certified Internist who was among the College founders and who is a nationally recognized leader in osteopathic medicine. Under Dr. Ferretti’s guidance, the Lake Erie College of Osteopathic Medicine has gained national prominence and it has realized unprecedented growth. By 2002, College growth and enrollment required LECOM to triple the size of the original medical school building, adding another 100,000 square feet of modern teaching, learning, and research facilities. 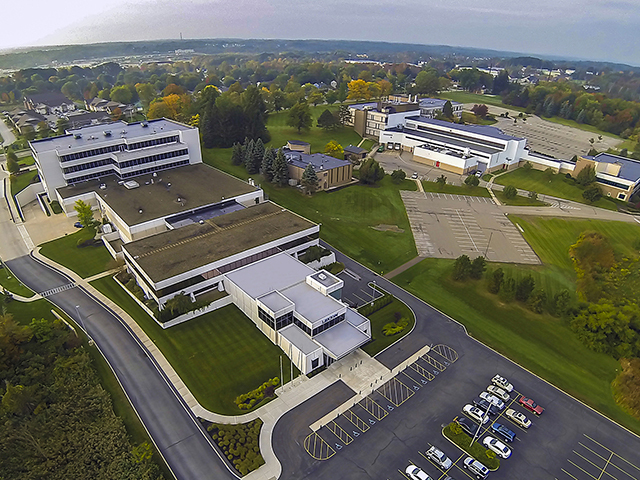 With the acquisition of the neighboring LORD Corporation property in 2011, the College is expansively situated along West Grandview Boulevard where a park-like, 53-acre campus boasts an excellent view of Lake Erie. A continually growing medical and wellness campus also stretches along Peach Street in Erie as the college and community engage in the whole-body wellness paradigm that has become LECOM Health, the only health system with an Osteopathic Academic Health Center in the United States. The College, Millcreek Community Hospital, and Medical Associates of Erie, the clinical practice network of physician offices located in Erie County form the core of this highly innovative medical education and patient care system. True to the College mission, to provide primary health care to Northwestern Pennsylvania, LECOM achieved another milestone with the addition of its School of Pharmacy. The Commonwealth of Pennsylvania approved the LECOM School of Pharmacy in May 2001. Classes began in September 2002, and LECOM held its first pharmacy school graduation in June 2005. Following that commencement, the LECOM School of Pharmacy received full accreditation from the Accreditation Council for Pharmacy Education. Since that time, LECOM has granted the Doctor of Pharmacy (PharmD) degree to almost 1,900 graduates. In keeping with its proven tradition of leading the field in medical education, LECOM initiated the Master of Science in Medical Education Degree Program at the Erie campus in 2005. This postgraduate course became the first distance education program at LECOM and it trains physicians to become teachers and leaders in the clinical education of future physicians. The College also offers the Master of Science in Biomedical Sciences Degree and the Health Sciences Post Baccalaureate Certificate. In addition to the original campus i n Erie, Pennsylvania, LECOM has continued its role in the vanguard of national leadership in osteopathic medicine by developing a branch campus in Bradenton, Florida. Located in the lush, palm-embowered setting of Lakewood Ranch, a master-planned community in Manatee County, Florida, LECOM Bradenton welcomed its first class of medical students on September 13, 2004. With the enrollment of the Bradenton Class of 2011, LECOM became the largest medical college in the nation. In 2007, the School of Pharmacy also expanded to Florida, offering a traditional four-year Doctor of Pharmacy degree curriculum and graduating the first class from LECOM Bradenton in 2011. The vision of LECOM continued in 2009, with the extension of LECOM Erie to the campus of the private liberal arts institution of Seton Hill University in Greensburg, Pennsylvania. LECOM at Seton Hill added an additional 104 medical students to the first-year class, and now, it has more than 400 students in total enrollment. In July 2012, the LECOM School of Dental Medicine welcomed students in Bradenton, establishing yet a new era in the betterment of health care education. The first class of dental students, who graduate today, completed their fourth year of study at community-based dental outreach offices in DeFuniak Springs, Florida, and in Erie, Pennsylvania. These sites were chosen, in part, because of the enduring LECOM commitment to provide care where it is most needed. Ever vigilant to marking innovative trends in education, LECOM added two Distance Education Pathways in 2014. The School of Pharmacy Four-Year Pathway has grown to allow students to take courses online. The Pathway offers one of only two online-distance education programs in the nation for pursuing the Doctor of Pharmacy degree. The first class of the Masters in Health Services Administration (MHSA) program graduated in 2015 and are sought after to fill key leadership roles in the administration of hospitals, clinical practices, and in other health care facilities. The MHSA program was ranked #6 in the nation by BestColleges.com in 2018. The Masters of Science in Biomedical Ethics (MSBE) degree was launched in 2018 to meet an unmet need for formally trained Ethicists ready to address the most complex moral and ethical healthcare issues of our time. The LECOM School of Health Services Administration was also created in 2018 to provide a center of excellence from which current and future LECOM healthcare business and compliance programs can be developed. Augmenting the noteworthy educational advancements, LECOM has been ever cognizant of its role in community enrichment, service, and the promulgation of health for all. With the 2009 opening of the John M. and Silvia Ferretti Medical Fitness and Wellness Center, the College founded a medically integrated wellness center that not only serves the fitness and medical education needs of LECOM students and employees of LECOM Health, but also provides a facility that offers to the populace of Erie County an opportunity to pursue a better quality of life through prevention and wellness. In 2011, LECOM expanded its community offerings in Erie by opening the Coffee Culture Café and Eatery to provide a relaxing study space for students and an attractive venue for the public to enjoy coffee or a light fare. In keeping with its unremitting mission of service and its unflagging goal to promote improved health for all, LECOM – in 2014 – became the lead agency for the Safe Kids Erie Program, which previously had been administered by the Erie County Department of Health. Safe Kids Erie strives to educate families and to raise awareness of the fact that the vast majority of injuries to children can and should be prevented. LECOM leadership of the Program also has created additional opportunities for students at the College to serve the community. Also in 2014, LECOM incorporated LifeWorks Erie into its family of health and educational services. The affiliation with LifeWorks Erie, which offers programs, services, and lifelong learning opportunities for individuals age 50 and older, has complemented and enhanced the ability of the LECOM Institute for Successful Aging to serve the growing elderly population throughout the region. In 2015, as LECOM wholly recast the very paradigm in comprehensive patient-centered health care, the LECOM Institute for Successful Aging opened the 138-bed LECOM Senior Living Center adjacent to Millcreek Community Hospital. The welcoming and homelike environment, coupled with a skilled nursing facility, is the next generation of innovative, compassionate, and comprehensive health care designed specifically for older adults. Ever aware of changing community needs, LECOM recognized the disproportionately growing senior population in Erie County by adding a multifaceted component to its health care programs for older adults. As part of the LECOM commitment to wellness for this growing age group, LECOM purchased Parkside Senior Living Communities comprised of three independent living and personal care apartment complexes, located in Erie, North East, and Millcreek. Life is change; growth is optional. In this area, LECOM always has chosen wisely. Knowing the way in which to grow is just as important as knowing when to do so. Thus, as the Lake Erie College of Osteopathic Medicine met the new year, 2016 began with multiple LECOM acquisitions, including Corry Memorial Hospital, LECOM at Presque Isle Rehabilitation and Nursing Center, and the Visiting Nurses Association of Erie County. The prodigious undertaking further solidifies LECOM as the seminal provider of a healthful and proactive amalgam of comprehensive services that afford older adults independent decision-making options throughout each part of the continuum of care. The beginning of all promising enterprises, undertakings, or accomplishments begins with an idea. With that idea usually follows a set of circumstances, which, in retrospect, appear to have forecast a prophetic outcome. Now in its 24th year, LECOM has developed an unassailable reputation as a leader in medical education and patient care, with its graduates highly sought after in the fields of medicine, pharmacy, and dentistry. LECOM also has set the standard for affordable education in a private medical college setting where graduates achieve outstanding board scores and journey forward to make a difference in the field of health care. The College established its venerable place in medical education through a multiplicity of attributes; one of its most noteworthy offerings focuses upon its student-centered Learning Pathways. LECOM became one of the first institutions to present its curriculum in multiple learning styles designed to address the specific educational needs of its students and it accorded to them a choice of three- or four-year programs. Coupled with its superlative curriculum, the character of those who practice their noble profession is at the heart of a LECOM education. Those in leadership understood that a physician embodies honor, professional appearance, purposeful action, and responsible behavior. The College adopted an honor code, a dress code for classroom and clinic, and professional policies that inculcate respect for the faculty. The visionary leaders of medicine who founded LECOM sought to develop the core attributes of that which defines a health care professional: the credo of the calling; the intrinsic purpose of the healer; and the foundation of that which carries a physician to seek the best version of himself or herself – for each defines the future of medicine. Much has transpired in two decades – education, enrichment, character and community – all within the prophecy of a prescient body of educators and physicians whose idea of the possible triumphed over doubt. The founders of the Lake Erie College of Osteopathic Medicine knew that their actions would inspire, their mission would bring purpose, and their commitment to a vision would result in a better tomorrow, not only for the generations of scholars who have crossed the threshold of a great institution, but also to the communities and to the larger world that they will serve in the calling of a lifetime.